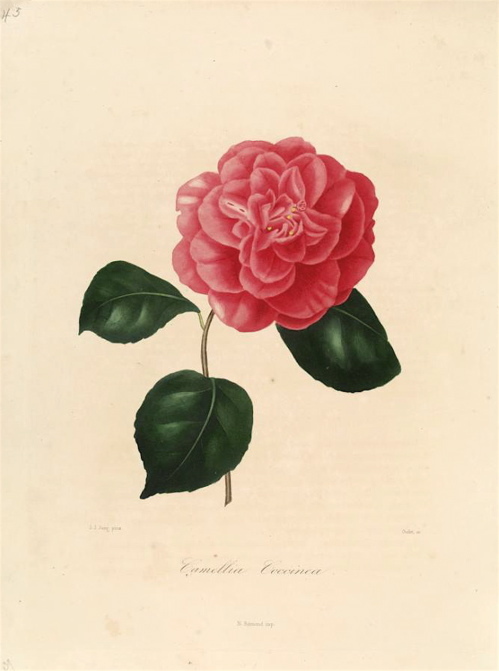 A cultivar of Camellia japonica L., ‘Coccinea’ has an informal double flower of bright scarlet with rounded petals. [ICR]. ‘Bud somewhat large, oval, acute, scales greenish; flower axillary, large, regular, double, of a deep cherry-red, No.4; petals of the circumference, imbricated, sometimes splashed with white; those of the centre small, rumpled, and irregularly arranged.-Very beautiful.’ [Berlèse Monography p.74/1838]. Berlèse Iconography vol.I pl.44/1841. ‘This variety was raised from seeds, by Mr. Allnutt, of Clapham. The flowers are remarkable for the roundness of their petals; they are pretty double, and of a rich scarlet colour, generally a little later than the other sorts.’ [LBC no.1237/1828]. Berlèse Iconographie vol.I pl.44/1841. Listed in all published catalogues [T.213/1843]. A plant was presented to the Sydney Botanic Garden on December 24th 1845 [RBGS AB]. Coccinea is listed in both the 1830 and 1836 editions of Loddiges’ Nursery catalogue, copies of which are held at Camden Park [CPA]. In the 1836 edition it is marked with a ‘c’ meaning grown at Camden.